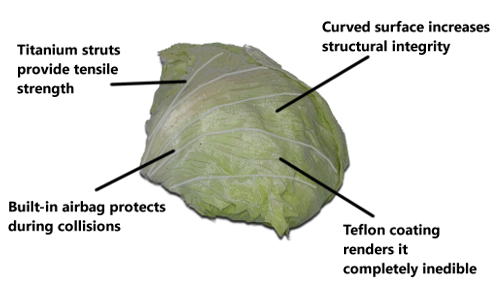 Biochemists have developed a new titanium-reinforced lettuce, which is over fifty times stronger than regular varieties. Thin veins of metal are interlaced with the leaves to provide high-tensile strength without compromising the plant's natural flexibility. This will make for hardier salads and can be used in the packed lunches of people with dangerous and high risk jobs, such as racing car drivers or stuntmen. It will also protect the crop from pests such as slugs and snails, as the reinforced leaves will wear the little bastards' teeth down.